If you are like most Americans, your ideal vision of retirement may conjure refreshing images of relaxing on the beach with your head buried in a book, spending time digging in your garden, or traveling to the faraway destinations you’ve always dreamed of visiting. Yet your vision may overlook a critically important piece of the retirement puzzle—ensuring that you will have enough money to meet your future health care expenses. So how much should you save to pay for rising retirement health care costs? For things like in-home health care, doctors’ visits, prescription drugs, assisted living facilities, and medical supplies? Recent research has revealed a sobering reality. The average couple who retired in 2016 will need approximately $260,000—after taxes—to cover their health care expenses from age 65 on. What role does Medicare play? Many people assume that Medicare, the federal health insurance program that kicks in at age 65, will cover their health care costs from A to Z when they retire. In fact, it pays only 62 percent of a retiree’s health care costs. And it doesn’t cover some much-needed services, such as routine dental and vision care, hearing aids, and long-term care. Out-of-pocket health expenses in retirement are inevitable, yet they can be managed with proper planning. Here are some tips to set you on your way to a healthy retirement, both physically and fiscally. Estimate your future health care expenses. Having a solid estimate of the health-related costs you may incur during retirement is an important first step. This free online calculator can help you arrive at a fairly reliable number and give you a target to shoot for. Your estimate should factor in many variables, including your age, family medical history, and drug costs. In addition, given market trends and an ever-changing political environment, you’ll also want to take into account the types of health care offerings that may be available as time goes by. Consider opening a health savings account (HSA) while you’re still working. For those who are covered under high-deductible plans, these self-directed vehicles combine high-deductible health insurance with a tax-favored savings account. Contributions are 100 percent deductible, and HSA owners can make tax- and penalty-free withdrawals when paying for qualified medical expenses, such as dental treatment, vision care, hearing aids, and other qualified expenses. Contributions to HSAs are limited to $3,400 for an individual or $6,750 for a family per year, with an additional $1,000 catch-up option available for those who are age 55 or older. Unlike a traditional flexible-spending account, an HSA balance is portable and can be carried over from year to year. An HSA may be opened individually or through an employer; in fact, the rate at which employers are adding HSAs to their employee benefit offerings has been rapidly rising. In some cases, employers make contributions to their employees’ HSAs. Please note, however, that once you sign up for Medicare, you may no longer contribute to an HSA and could be penalized for doing so. Still, maintaining this type of account during your working years could free up additional money to sock away in your retirement account. Explore long-term care coverage options. As unpleasant as it is to imagine, later in life we may need assistance with even the apparently simple tasks of daily living, including getting dressed, bathing, and feeding ourselves. In fact, each year more than 8.3 million Americans require support from a long-term care provider such as a home health care service, an assisted living facility, or an adult day care center. The theme for long-term care planning, as with most retirement savings strategies, is crystal clear: start early. Purchasing long-term care insurance while you are still relatively young and healthy is paramount. Once your health deteriorates, premiums may increase significantly—or worse—you may not be eligible for coverage. Schedule an appointment with your licensed insurance agent to talk over your options, or ask your financial advisor to recommend some potential carriers. Stay healthy! What else can you do to mitigate health care costs as you age? Focus on a healthy lifestyle today. Regular exercise, proper nutrition, and preventative doctor visits can all have a positive impact on your future quality of life. If you commit to getting periodic checkups and screenings, you can increase your chances of living a longer, healthier life and of reducing health care needs and expenses. Of course, this is easier said than done. But making difficult choices in the short-term—like quitting smoking or reducing the amount of sugar you consume —may give you the physical and emotional momentum to live out your retirement years in style. Is Your Gym Membership Working Out for You? Going to the gym is a popular way to accomplish fitness goals. Yet, out of the 58 million Americans who have a gym or a health club membership, 67 percent—almost 39 million people—never use it. Consider this: The average gym or health club membership costs $58 per month (or nearly $700 a year). So, ask yourself, are you getting the most out of your health club membership? If not, why not try an alternative? How about engaging in some free activities to get your fitness fix—such as walking, jogging, playing tennis, or starting a home workout program? Pursuing those kinds of healthy activities—and saving that monthly gym membership cost—will actually put some money back in your pocket. Money you could deposit in your retirement savings account! A popular theory—maybe you’ve heard of it—claims that committing to steady, incremental change can be a hugely effective driver of success. The same can be said of saving for retirement. 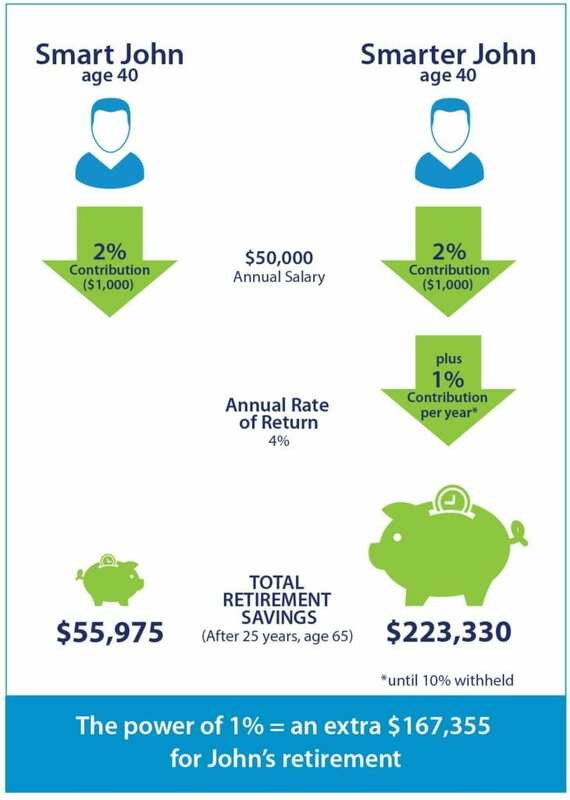 Here’s an example of how depositing just 1 percent more of your annual salary into your 401(k) can have a monumental effect on retirement savings goals. John, age 40, earns $50,000 per year. He has been depositing 2 percent of his salary into his 401(k) plan for the past 12 months. If he continues to deposit 2 percent of his salary each year for the next 25 years—and assuming that his investments earn a 4-percent annual rate of return—his 401(k) account will have a balance of $55,975 when he reaches age 65. Not bad. But could it be better? Let’s say that John automatically increases his contribution to his 401(k) by 1 percent of his salary per year until he reaches an annual 10-percent contribution. His account will have a balance of $223,330 when he turns 65. For John, the power of 1 percent will earn him an extra $167,355 for retirement! Why not up your contribution to your 401(k) or 403(b) account each year until you reach at least 10 percent? By doing so gradually, you’ll barely notice the change in your paycheck and you’ll be taking a giant step toward a more solid financial future. Use this free calculator to see what effect the power of 1 percent will have on your retirement savings account. Contact your employee benefits coordinator today. Commonwealth Financial Network® does not provide legal or tax advice. Please contact your legal or tax advisor for advice on your specific situation. Authored by the Retirement Consulting Services team at Commonwealth Financial Network.